Hey y’all, today has been a fun day! Pepper and I woke up bright and early, got ready, hit the road to travel a couple towns away to go to one of my favorite stores. Hyvee! I just love it there, honestly. So many good things. Living in a smaller town makes it not easy to find a lot of certain types of groceries. I used to travel 45-60 miles to get specialty stuff and let me tell you, I am so over that. I haven’t done that in over a year now. I pretty much make what I have to work with work for me because ain’t nobody got time to drive 45 miles for special groceries. What special groceries am I after, you ask? Well the list is a long one, but for example a jar of Piquillo Peppers! I have been searching for a jar of piquillo peppers since one of my oldest friends got married in May. Why was I searching for said peppers? Because she had the most delicious food at her wedding reception and one of the dishes featured were these little peppers stuffed with chorizo, spinach, and cheese and I am still thinking about them six months later. So, I saw those peppers today and I grabbed them and I was entirely too excited about it. I told MY lil Pepper (Ha!) all about these little stuffed peppers that I was going to attempt to make and she just looked at me like…”I have no idea what you’re talking about. And I want chocolate chip cookies.” and I stopped because as much as I love my sweet lil girl she just doesn’t get it yet. Oh, but one day she will! And she’ll be glad I found those peppers at Hyvee. End of that story. I’m sorry but, this post has NOTHING to do with those peppers. I need to play around with that recipe because I have never made anything like that before and also, there’s no recipe. It’s just something I had 4 bites of five and a half months ago and I still can’t get it outa my dreams! Okay. So, While Pepper and I were shopping a lady was giving out samples of soup and I grabbed one because Hi free soup? Don’t have to ask me twice. (or even once really, if I see you with free soup, I’m taking it.) 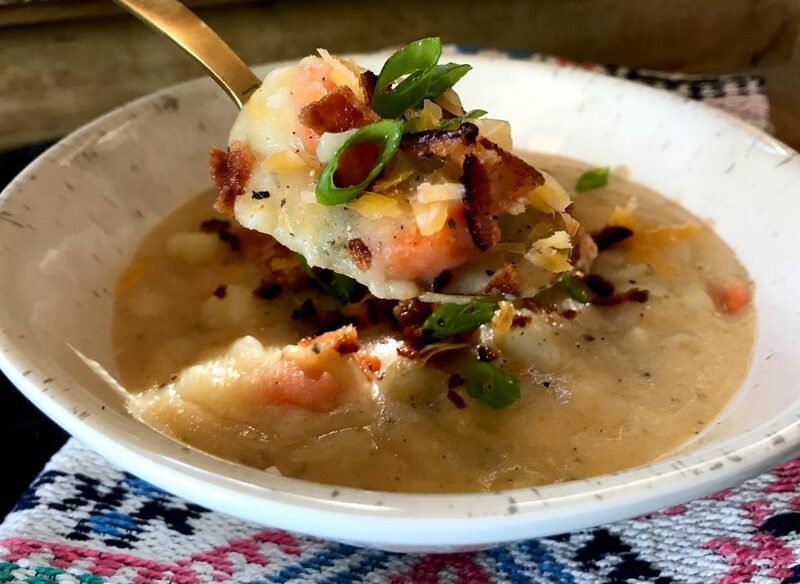 She gave me a tiny cup of creamy baked potato soup and my mind shot back to before Pepper was born and when I used to make creamy potato soup often for Eric and I to enjoy out of big bread bowls on a crisp autumn eve. Don’t ask me why, but I haven’t made it in years. 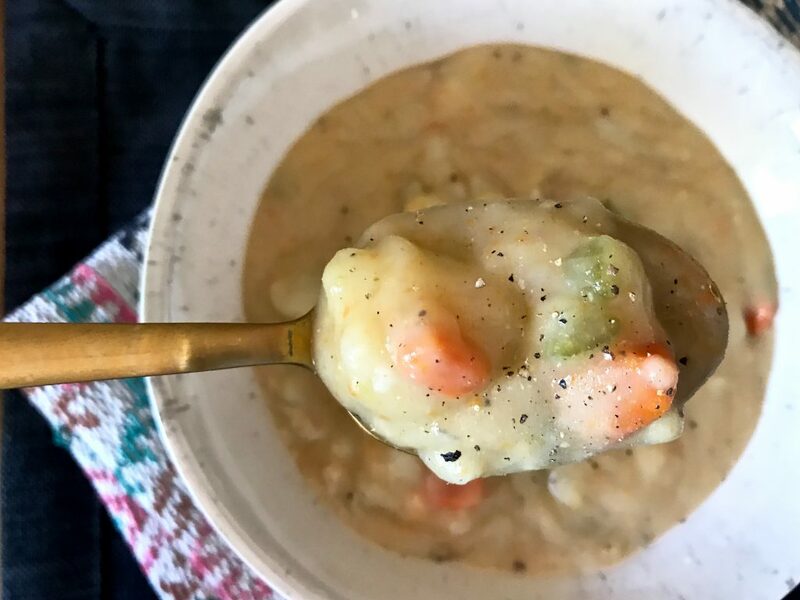 I quickly grabbed the ingredients that I needed for my soup and decided that this pot of comfort needed to be featured on the blog as soon as possible. How in the world did I remember that recipe off the top of my head when I can’t even remember if I brushed my teeth this morning? Easy. My mom taught it to me a very long time ago. It doesn’t have any fancy ingredients. Most of the stuff I almost always have at home already. So, the only thing I needed to pick up was celery, bacon, and some extra milk. Ready for this? 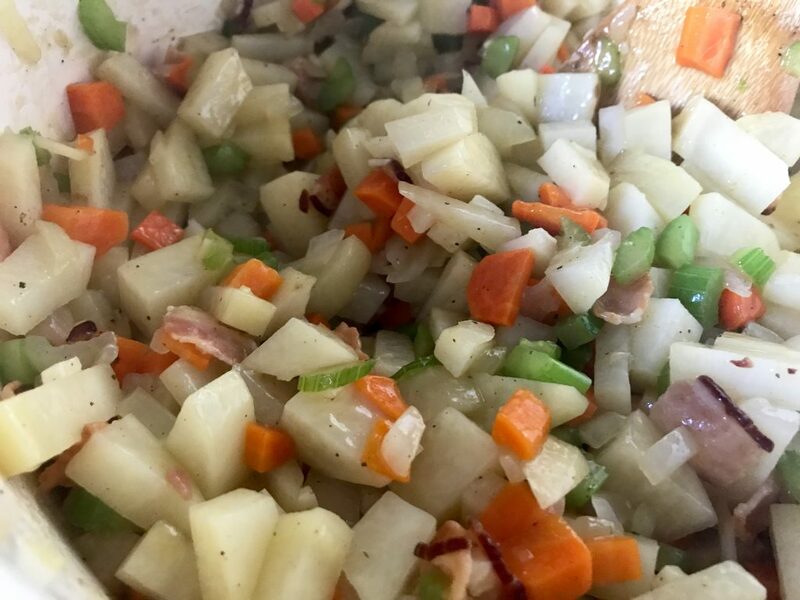 You need garlic, onion, celery, carrots, potatoes, bacon, chicken broth, milk, flour, salt & pepper, and dried ground sage. That’s literally it and this soup is dreamy! Now, if you want to make it more of “loaded baked potato” type of soup which is almost always done around here. You’ll need some cheddar, sour cream, and green onions. But honestly, it’s super delicious on it’s own and I love enjoying a piece of freshly warmed bread along side to use to dip it in. The best part about this recipe? It’s so very warm and inviting. The house smells so good when you make it. This is the kind of soup that you just know by heart after making it once or twice. You make it for friends, family, or anyone who just needs a good, warm meal. I honestly can’t believe it has been so long since I’ve made this soup. I actually called Eric while he was working to yell a bit at him and ask him why hasn’t he reminded me about the soup! I mean, really! The soup, man! 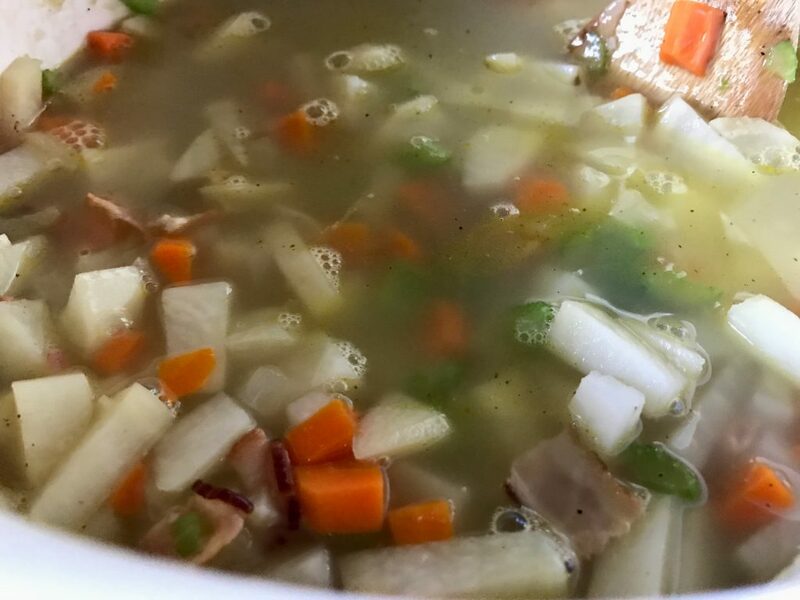 Lets get in the kitchen and I’ll show you how to make this bowl of soup that reminds me of a big hug on a cool day. 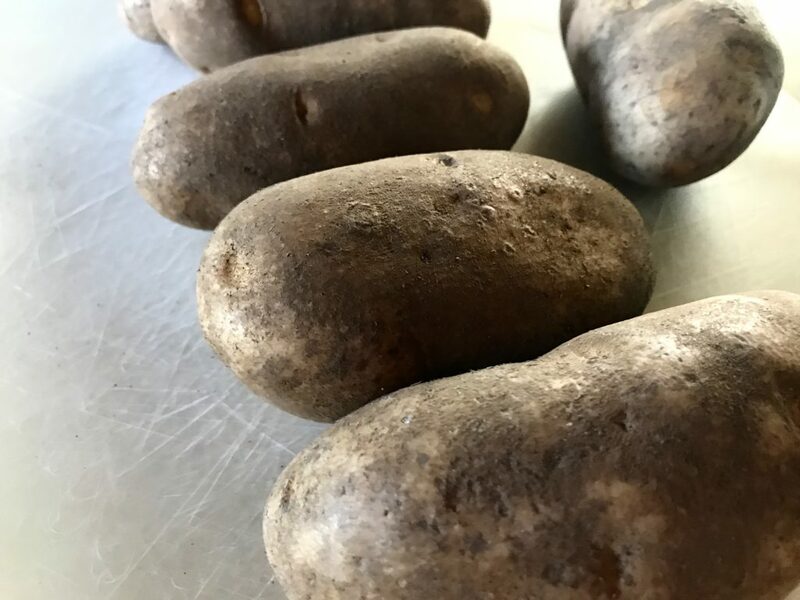 Grab a few potatoes approximately 6 medium sized ones. 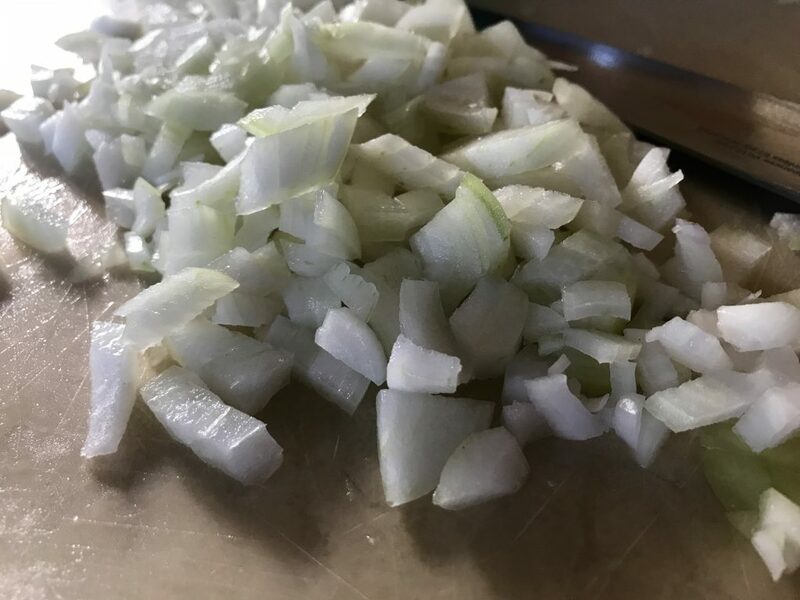 Grab a sweet onion and chop it up real good. 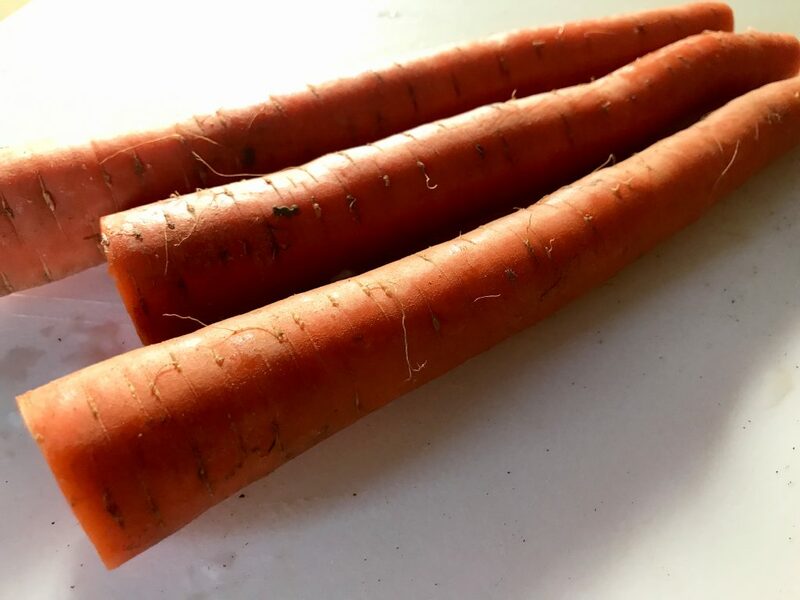 Now, grab a few carrots. Okay, I know I’m having you chop literally all of the veggies. 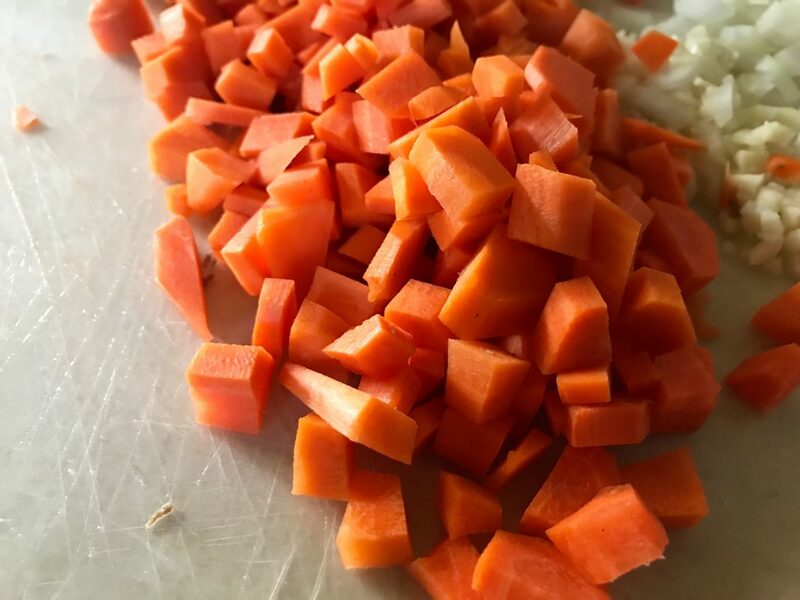 I personally find chopping veggies a bit therapeutic which I know many people absolutely do not. 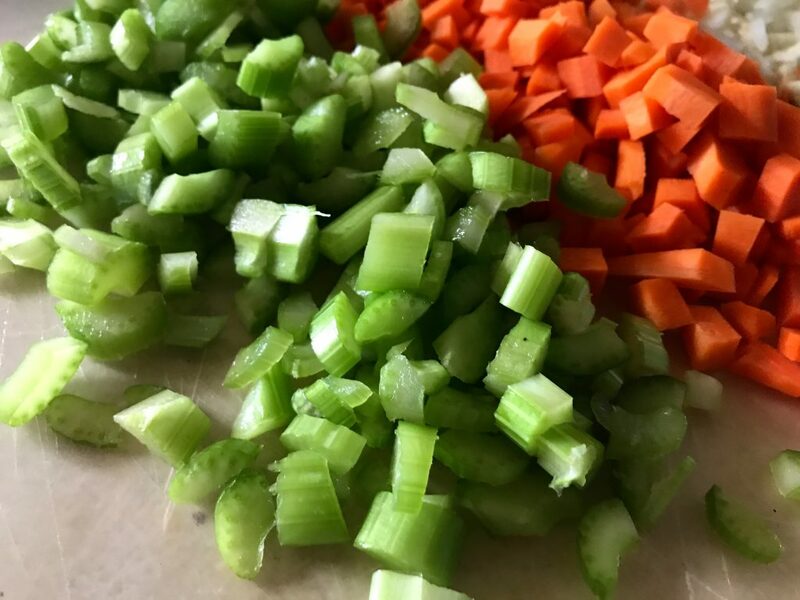 If you have a child now might be a good time to teach them how to use a knife if not, you can buy some already cleaned and chopped veggies fresh in the produce section to cut down a smidge on the prep time. 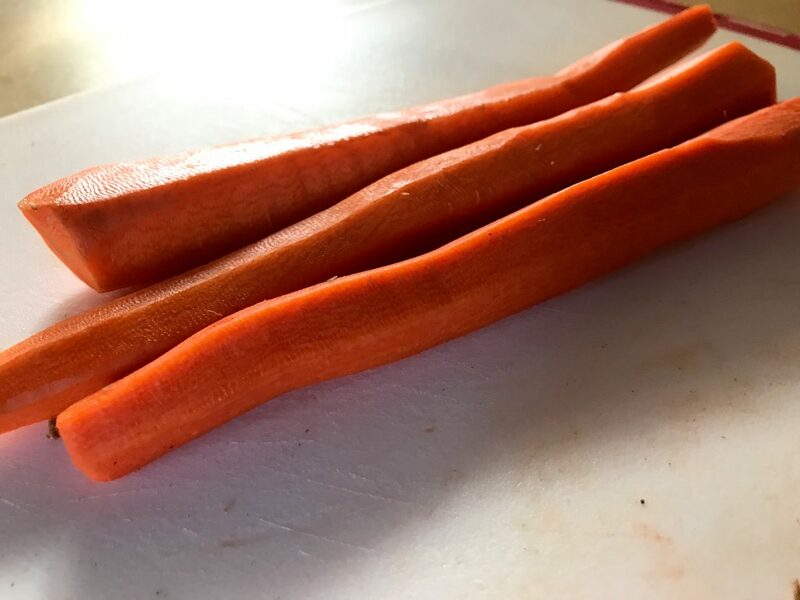 But, If you’re just gonna chop all the veggies like I do… Trust me, you will be rewarded for your all of your hard work at the end. Just wait! 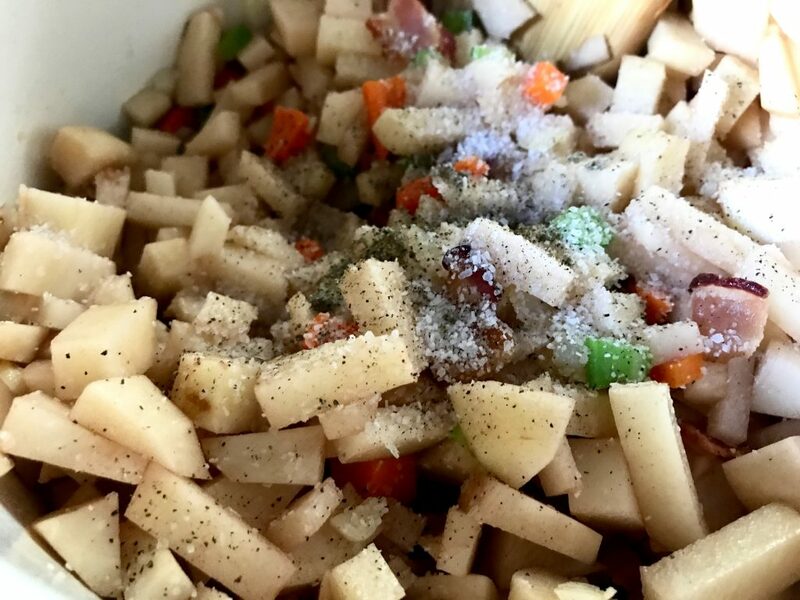 Chop’m up into tiny-ish pieces. These aren’t as tiny as they may look. Please don’t hate me. 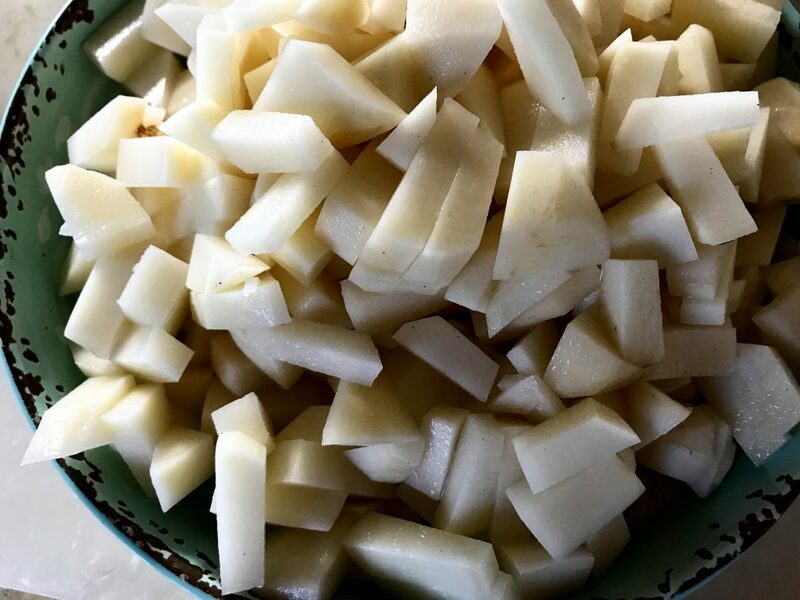 Chop up three stalks of celery. I’m just kidding. Don’t forget to dice up some bacon. 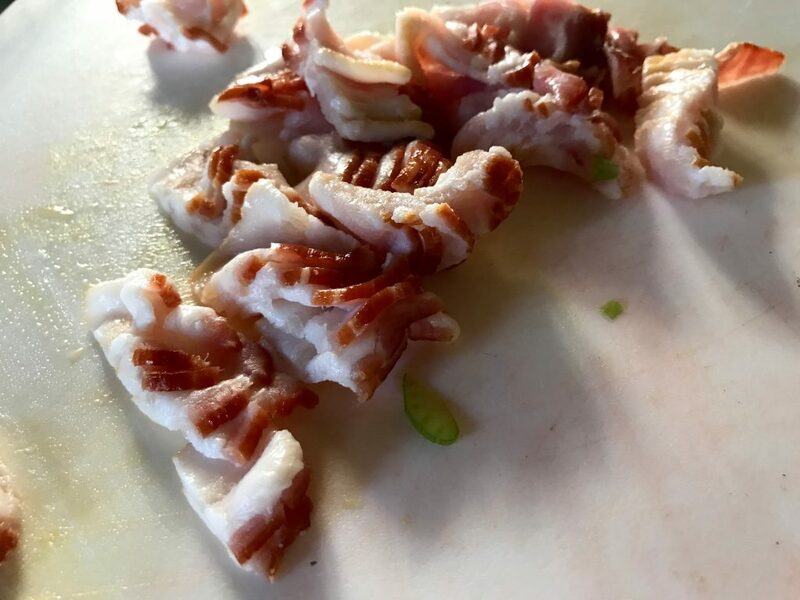 Throw that bacon in a big stock pot and cook over medium heat until crispy. 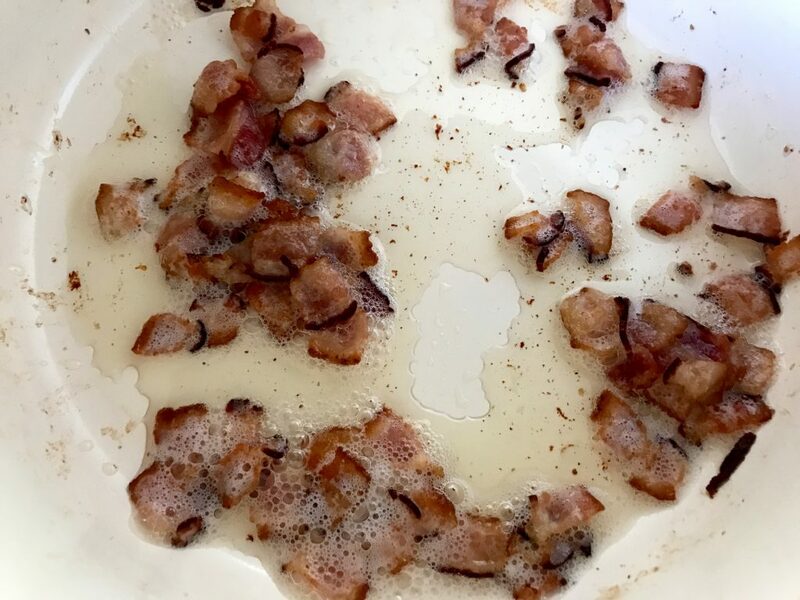 Drain about 97.9% of the grease after the bacon is cooked. 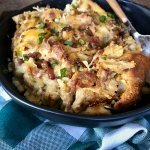 I leave the bacon to cook with everything because it gives it such a smokey, hearty flavor. 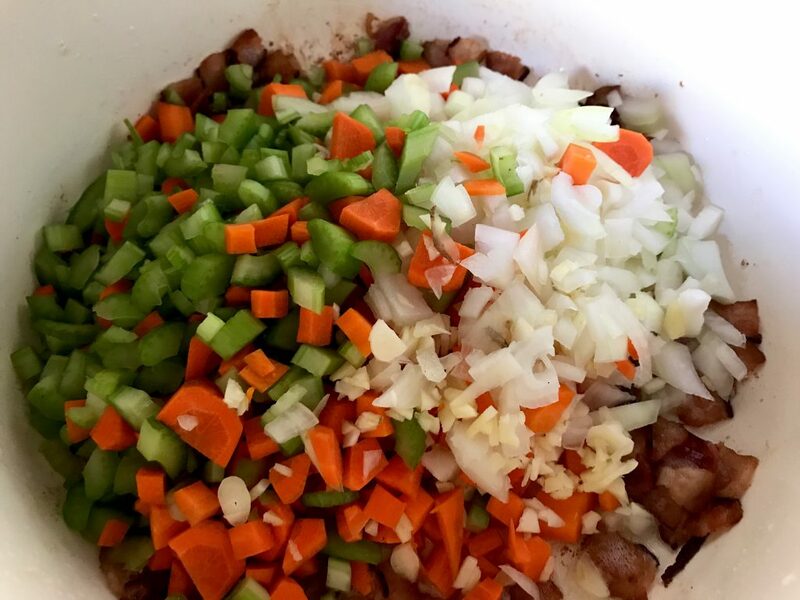 Add the chopped celery, garlic, carrots, and onions to your pot and stir it all about. Saute over medium heat for about 3-5 minutes until softened. Add those taters with a bunch of pepper, some kosher salt, and a bit of ground dried sage. Note: If you absolutely do not like sage I’m going to go ahead and recommend that you do not use sage. 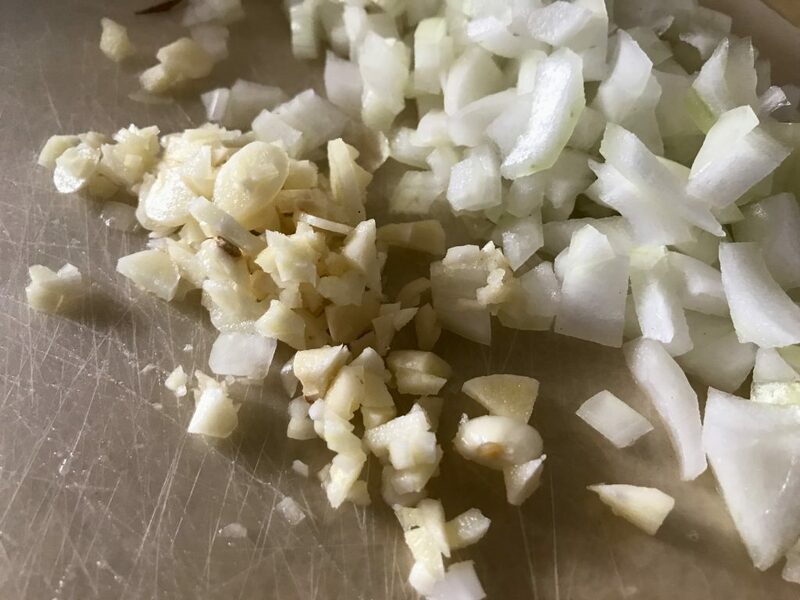 This soup is a blank canvas for flavor you can make it spicy by using cajun seasoning or just simple by using a bit of Lawry’s Seasoned Salt. I’ve also used a little rosemary. I personally love sage and use it so much in the Fall months. I love to incorporate it into a lot of my soups and stews when I can! However, I do know some people have a serious distaste for the stuff. So it’s up to you! If you’ve never really had it, give it a go! It’s a very LIGHT undertone in the soup. Cook all these goodies together over medium heat for about 5 more minutes. Pour in chicken broth and bring to a gentle boil. Continue to cook for another 10 minutes or until the potatoes are fork tender. In a small bowl whisk together 1/4 cup flour and 1 cup of milk. When the potatoes are tender add the flour/milk mixture to the soup and continue to cook over medium heat for about 5 minutes stirring fairly consistently. Next! This is very important. If you’re going to use a blender to blend up the soup. You will need to blend in small batches. Trust me on this, I speak from experience when I say if you do not blend in small batches you will have a mess and you will hate my guts. I usually use my immersion blender and blend to the consistency that I want, but fancy that, I couldn’t find it when it came time to blend the soup. 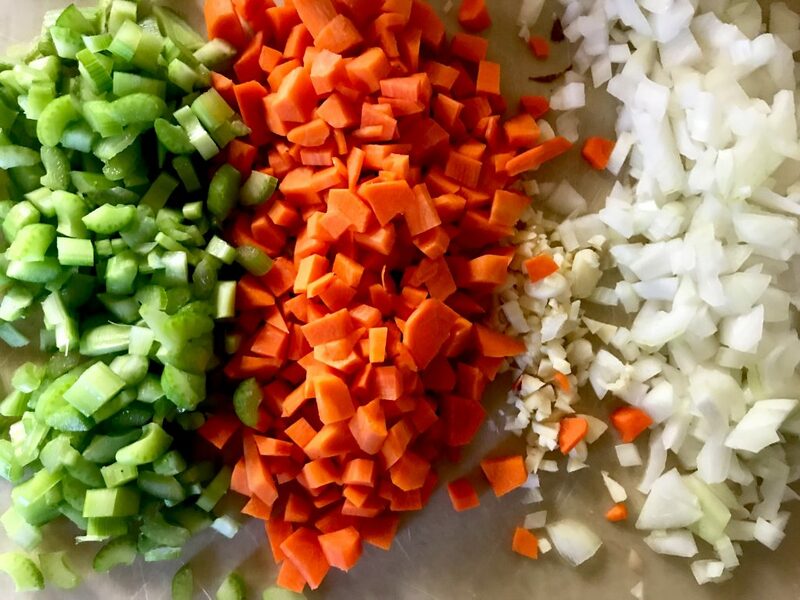 I usually blend up about 4-5 cups of the soup and it’s the perfect consistency for me. Do whatever your heart desires! Return the blended soup to the not blended soup and stir together and serve it up! P.S. Remember to blend the soup in small batches. And there ya have it… a delicious little bowl of creamy, dreamy potato soup that I like to refer to as a hug in a bowl. As you can see I like it a bit chunkier. It’s really a personal preference. If you’d like a bit smoother potato soup simply blend up a few more cups of the soup. 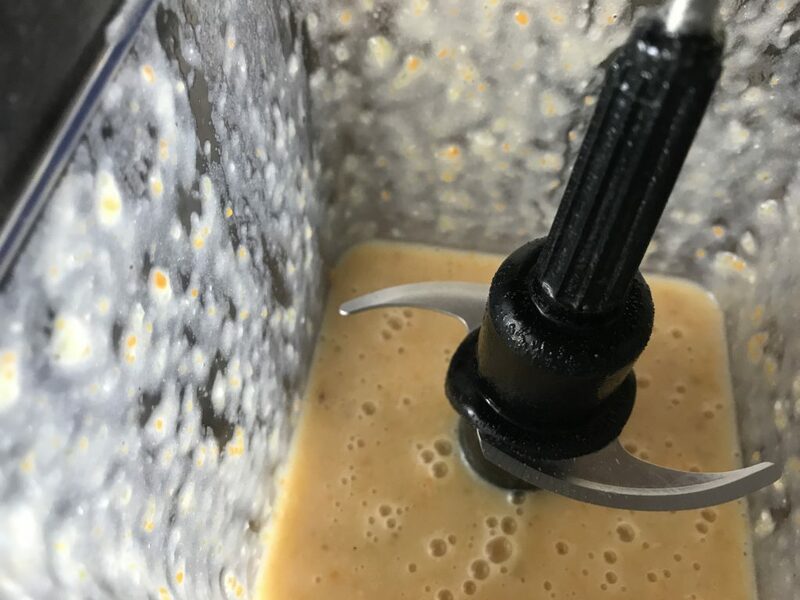 If you’re using an immersion blender just blend until you feel like it’s good. 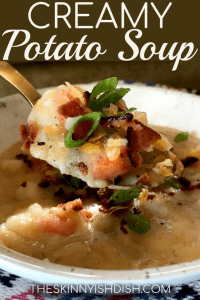 I almost always make sure we have all of the fixin’s to turn it into a Loaded Up Potato Soup! It’s my favorite way to enjoy it. 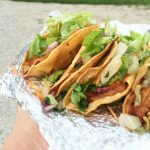 Man alive, my mouth is watering as I write this post. I really just love this soup. A lot. Sadly, I am finishing this post later than I had anticipated and this soup is no longer in my fridge. *cries a river* Grab the tissues. Go make this and your bellies will be so full and so happy. I promise. 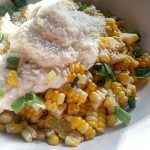 It’s the perfect bowl of comfort and it’s just as delicious as can be. Let me know how it goes, y’all. P.S. Please blend the soup in small batches if you are using a blender. 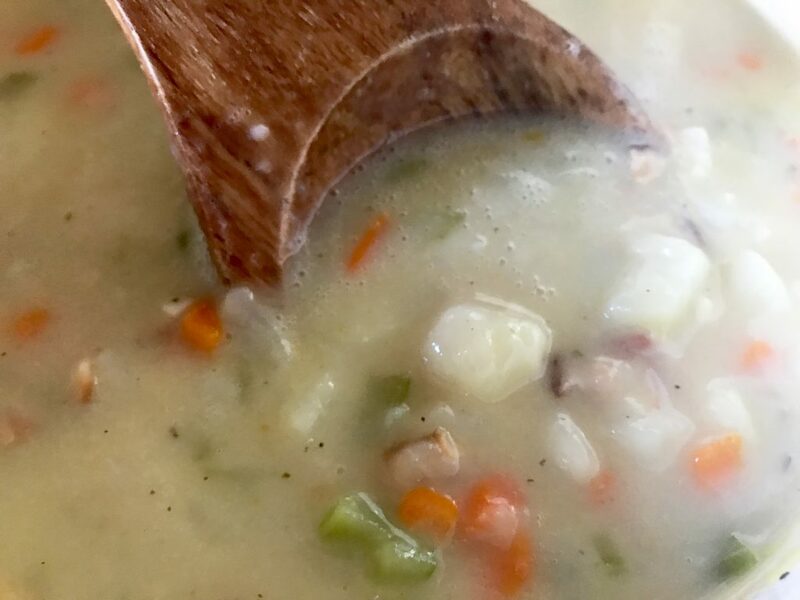 A lighter version of a classic soup. Add bacon to a large stock pot and cook over medium heat until crispy. Drain grease. 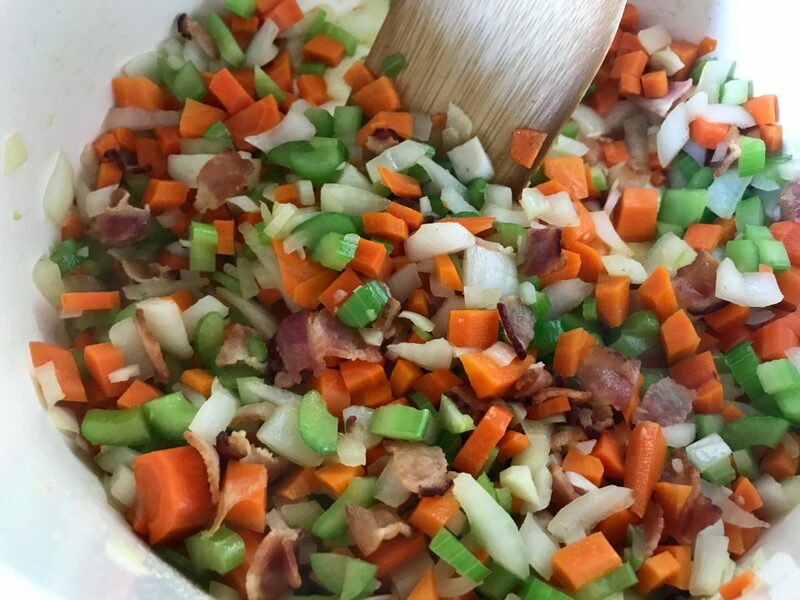 Add chopped carrots, celery, garlic, and onions to bacon. Stir all together a cook over medium heat for a few minutes or until softened. Add potatoes, kosher salt, pepper, and ground sage to the vegetables and bacon. Cook all together for about 5 more minutes over medium-high heat. Pour in chicken broth and bring to a gentle boil. Continue to cook for about 10 minutes or until the potatoes are fork tender. 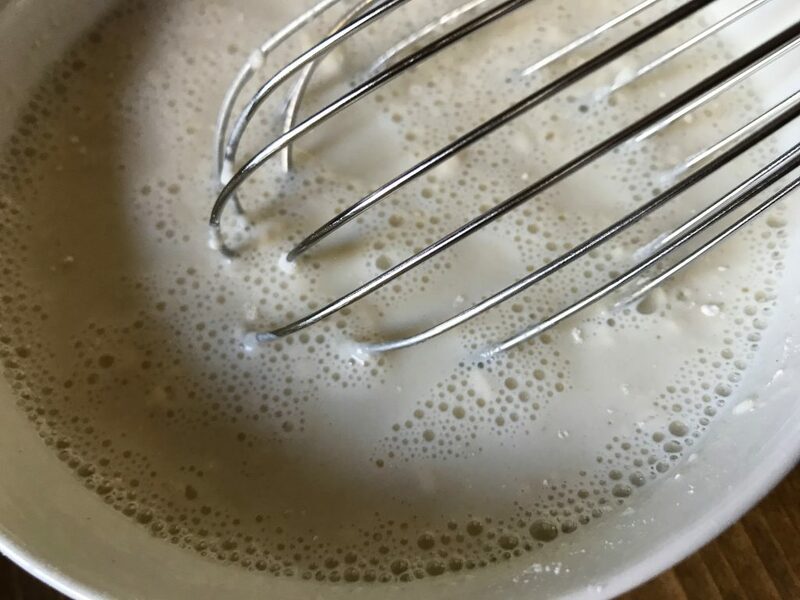 In a small bowl whisk together flour and milk. 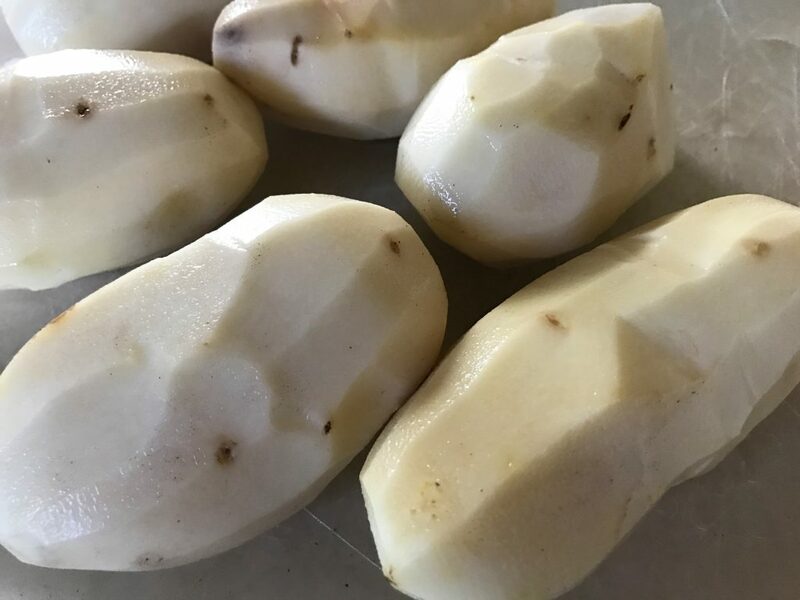 Add to soup when the potatoes are fork tender. Continue to cook for about 6-8 minutes over medium heat and stirring consistently. 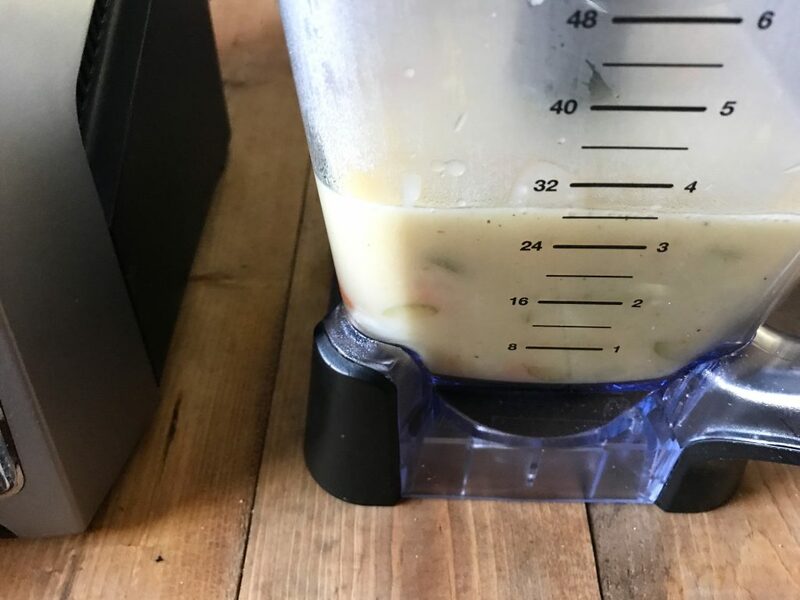 Blend together about 5 cups of soup in a blender on the lowest setting or use an immersion blender to blend soup together until reaching desired consistency. I prefer a chunkier potato soup so if you'd like a smoother consistency blend more soup in small batches. 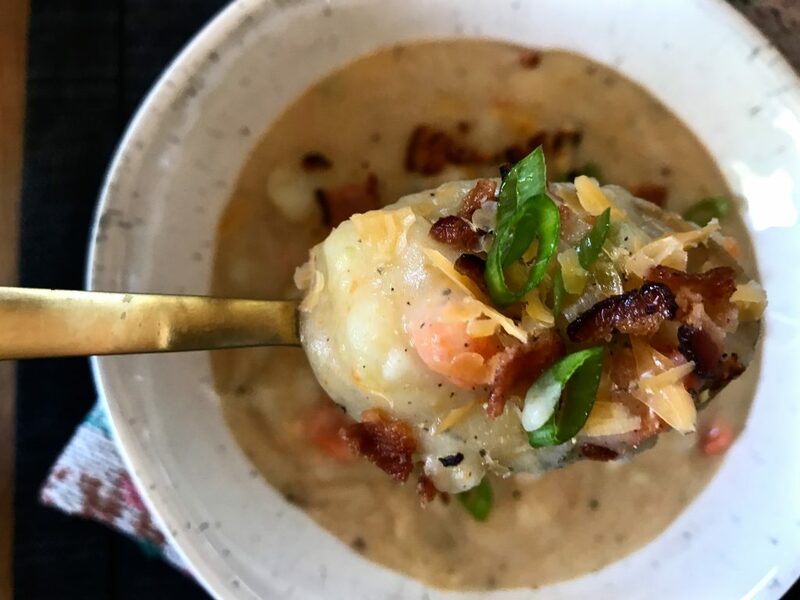 (Optional) Garnish bowls of creamy potato soup with some crumbled bacon or real bacon bits, green onions, cheddar, and/or sour cream for a delicious loaded up version of potato soup. Suggested serving size: Heaping one and a half cups. Note: If you absolutely do not like sage I'm going to go ahead and recommend that you do not use sage. 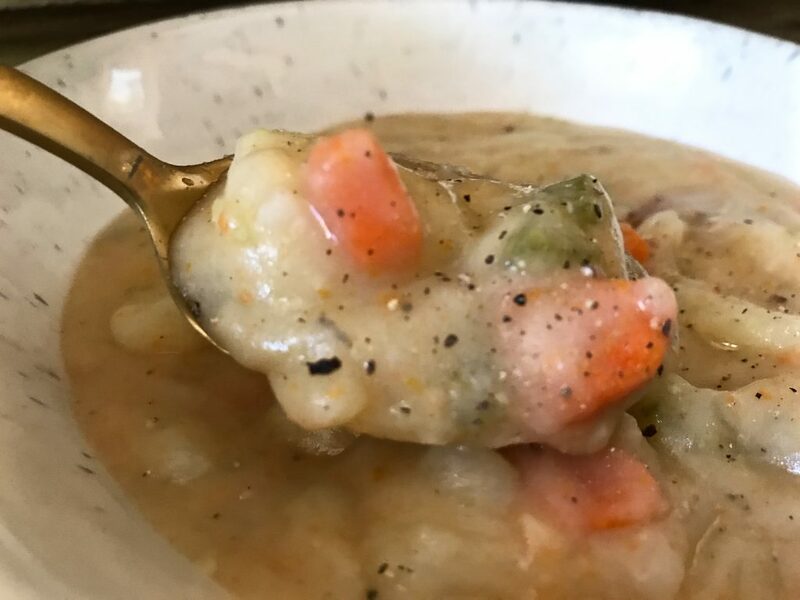 This soup is a blank canvas for flavor you can make it spicy by using cajun seasoning or just simple by using a bit of Lawry's Seasoned Salt. I've used rosemary before too. I personally love sage and use it so much in the Fall months. I love to incorporate it into a lot of my soups and stews when I can! However, I do know some people have a serious distaste for the stuff. So it's up to you! If you've never really had it, give it a go! It's a very LIGHT undertone in the soup. « Make Ahead Freezer Friendly Pepperoni Pizza Sandwiches! This soup is amazing! I added shrimp to mine. What a game changer!! 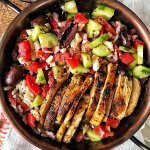 Thank you so much for sharing your recipes!! 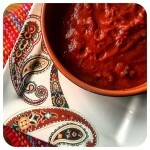 Hi Tricia, Thanks for stopping by to comment and rate the recipe! Shrimp, huh? I would’a never thought to do that. So happy it was a delicious addition! This soup is DELICIOUS! I loved it! Made this soup tonight. My family and I loved it!! I cannot wait to make more of your recipes!! Next up is Italian sloppy joes! Yum! I made this last week, portioned out enough for 5 days of lunch/dinner for myself to grab and go, and then froze the rest. 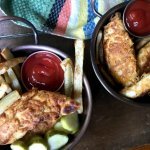 We are always busy running during the weeknights, so this is great for a quick meal so that I can stay on track with points. My 11 y.o. daughter DEVOURED 3 of my 5 day portions. She had one before soccer practice, then another afterwards in the same evening. And then another afterschool the next day. She keeps asking for me to make another pot! Thank you Star! So good! Oh I am SO glad to hear you and your daughter enjoy this soup so much. I love how comforting it is during these cold winter months. Thanks so much for stopping by to comment and let me know! The Freestyle Points say 6 however, when I enter the nutritional values into Weight Watchers Quick Add it comes up as 8. Could you tell me why this might be the case? 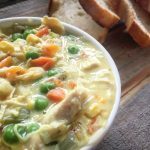 I LOVE this soup and have made it so many times. Thank you for your recipes. hey there! I figure out the nutritional info in My Fitness Pal. The nutritional info includes EVERYTHING in the recipe including things that are considered to be zero points on Weight Watchers. That means that things like carrots, celery, onions are factored in and have calories, natural sugars, etc. When I figure out recipes for the Freestyle Points. 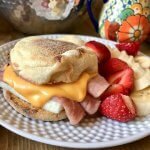 I input everything into the Weight Watchers Recipe Builder on the app/website. So basically, the calories/points will not match up. 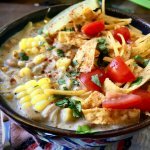 So, I know typically potato soup isn’t freezer friendly, but has anyone tried freezing this? Star – this was perfect on this rare, rainy, Northern California night. So delicious! Hahah!! I love that I am known somewhere as the sausage gravy casserole lady. As for freezing the potato soup, I have seen a couple say they have frozen it and that it was good after they reheated it. However, I haven’t tried it yet so I can’t tell you for sure! I’m so happy you enjoyed! Would it be OK to use almond milk instead of 1% ? would it make a large difference in the thickness of the soup? It really should be okay, but make sure to use unsweetened almond milk. Hope you enjoy! I made this tonight, very delicious. 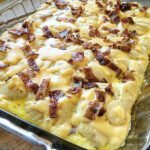 Thank you for a great blog with amazingly great recipes!! My picky husband gave this a thumbs up! I couldn’t believe it! Ha! It IS a hug in a bowl. This will be a winter staple for us! I would recommend to add all the garnishes to make it “loaded,” it’s sooo good! PS- I didn’t have any sage, and not a super fan of it, but used 1/4 teaspoon poultry seasoning, & I am glad I did, it added such a nice hint of flavor. Thank you Star! Hi, Star! My name is Emily and I’m 14! Mom has been making a lot of your recipes lately and let me tell you, these recipes are SO good!! My absolute favorite has to be tonight’s which was this bomb “Creamy Potato Soup”. All of your recipes turn out so good and are so yummy! Thank you so much for continuing to make amazing recipes! Keep up the good work! Hi Emily! Thank you so much for stopping by to leave a comment! I LOVE THIS SOUP TOO! Like, A LOT. I’m so glad you and your mom are lovin’ them so much. I hope you continue to enjoy whatever y’all try. Thanks so much again!